Recycling has become almost a religion in Oregon and now is about to become more expensive, if it survives at all. That’s the word from Republic Services, the refuse collection and recycling company in Albany and elsewhere. One problem is that people have been throwing a lot of trash into their commingled recycling carts. Another is that China, which buys most of the sorted recyclables from the West Coast, has cut the allowable contamination of the material from no more than 2 to 0.5 percent, a standard impossible to meet. Yet another is that the markets for certain kinds of recyclables have altogether disappeared. Some refuse companies in Oregon, in Medford for example, have limited what people can toss in their carts. No more magazines, for instance, though newspapers and ad inserts are still allowed, as are cardboard and tin cans. But pretty much nothing else. 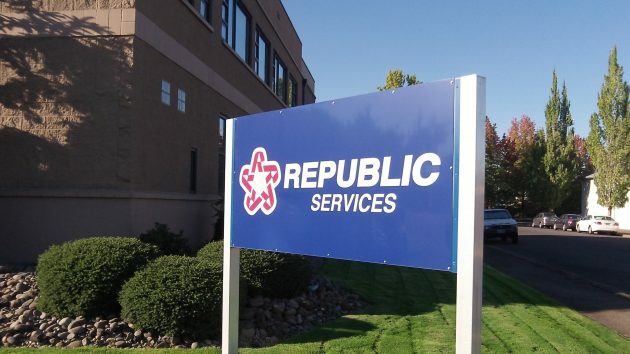 In Albany, Republic Services is taking the issue to the city council on Wednesday night. It came up with three options: 1. Urge customers to be more careful about what they put in their carts and charge them $2 more per month. 2. Forget about recycling and take everything to the landfill, and raise the monthly fee $1 to reflect the dumping costs. 3. Combine continued weekly commingled curbside recycling with weekly yard debris pickup, with the added benefit that food waste can go in with the yard debris, but jack up the monthly price $4.50. However this shakes out, in the long run we clearly we need a new approach. It makes no sense to keep piling up discarded material for which there is no economical use. Dumping it in a landfill may be the best for now, but how long can that go on? One of these days Coffin Butte will be full, and it looks to be getting pretty close. I’ll take option 2 hands down. It is really hard to buy anything w/o packaging. We need industry to embrace the problem and reduce the amount of packaging for their items. Also, if you buy something and leave the packaging behind, that doesn’t solve the issue, it just makes it the stores problem instead of yours – they still have to get rid of the packaging. I say Option 1 or Option 3 and not to give up. We can’t just throw everything in the landfill. And, yes, boycott Costco and all their packaging and quit buying stuff, period! Going back to the old days of backyard incineration? Option 2 will be very short lived I’m afraid. Coffin butte will fill and at a MUCH faster rate without recycling. When that day comes you can be assured that garbage rates will substantially increase because a new dump will most likely be in a location further away. I know first hand the impact of waste. I have visited all the places in Oregon where our Mid-valley recycling ends up.Our garbage too. We need to REDUCE what we use,less packaging would save tons of dump space. REUSE that pesky plastic bag, fix or repair items instead of replace them and lastly RECYCLE everything you have that is no longer wanted . Donate used clothes and compost food scraps. Many things have a multitude of uses. These are just a few examples. Hey they don’t call us Consumers for nothing. Waste not want not. All landfills will eventually fill up. Reducing excess packaging is clearly a good idea, but my guess is that it more the product manufacturers trying to reduce theft for their distributors. So folks, you can either ignore what’s happening or try and have something done about it. It’s a problem we all make and we could do something about it if we want. It’s your choice. Option 4 – time to get bids from other curbside recycling companies which are, apparently, better at public education about leaving over-packaged items on store shelves (in lieu of more consumer friendly packaged items) and informing customers about what goes in which bin. Republic Services had a net profit of over $600 Million in 2016 which is part of why their stock value has doubled in the part 5 years. Profit-making is fine, but it should come from employing the “better mousetrap” – not just charging more for the old one that mice have wised up to. I see. Why is it that only one side is stuck with the provisions of the 10-year contract? That tells me this is a non-starter. Tell them no and have them come back near the end of the 10-year contract. All the waste collection companies are similar. You will get the same with Waste Management as you do with Republic. They are not going to do it for free. There needs to be some sort of profit We have some of the lowest charges on the west coast. Be thankful you are not paying double for the service. I’ve done a lot of thinking about the 2% vs 0.5% contamination limits and don’t blame China for it’s decision. China has been the dumping ground for everybody’s toxic junk for too long. In my apartment complex, it’s hard to imagine 2% being achieved, though I see clean, orderly bins of empty wine bottles elsewhere in the neighborhood every Monday evening. Maybe if we stopped treating recycling like a religion (thereby encouraging everyone’s offerings) and promoted it as something special to be taken up only by the select few (non-idiots and non-slobs), we could actually get to 0.5%. Might need active management (big nasty boss) at the point where and when recycled materials are accepted. Doesn’t seem easy. Wait a minute – option 3, if I read it correctly, says that things like tin cans, plastic bottles, etc will be combined with yard debris and food waste. Those things do not deteriorate. That means someone will still have to sort all the stuff in the “yard waste” container which in turn will probably mean someone will have to invest in some additional equipment to provide a means to effectively sort the debris. That may be why the increase would be so much. The problem can probably be laid at the feet of the 10% percenters who throw diapers, etc in the recycle which in turn contaminates useable items. This is a problem , people can’t follow written instructions. I wonder… Since the online buying process has become such a behemoth, possibly those sellers aka Amazon, etc., could require their suppliers (regardless of who) to ship the items to them in 100& recyclable packaging – with NONE of the “hard plastic see through crap,” etc., Amazon has the scale to then ship it in their easy-open cardboard boxes. It could result in less overall “size” of the box it is shipped to the consumer. Drawback would be cost for the supplier to ship without normal “retail store” type packaging. And might require the end-consumer to keep the shipping box for ANY kind of return. The first clause of option 1 will not be effective. Separation rules are too unclear, and is what causes the contamination now. Folks do not know what is recyclable and what is not. There are too many products to consider. I have believed this ever since ‘co-mingled’ recycling was introduced, rather than having separate bins for cans, glass, and paper. Another impediment to recycling is the low value of the recyled matter. I thought of this recently, as I wondered why schools do not do ‘paper drives’ as they did when I was a kid in the 1970’s. I did a bit of research, and what I learned is that the cash that one can get for recycled newspaper has dropped so low that it just is not worth the money to groups to recyle. Here is an older article on it, but I expect the economics of it are still true: http://articles.latimes.com/1991-03-15/news/vw-405_1_paper-drive. I believe the same economics apply to glass. This country used to reuse and recycle glass jars of all kinds: mayonnaise, ketchup, pickles, etc. But the cash value is not there today in this country. Still, assuming that a market for a clean supply of these materials can be found, it seems like an end to co-mingling would be a better option. If we were to focus on just tins and glass, most consumer could do that, as they are a easier to identify. Newspaper seems to have little value, and decomposes anyway, so why not allow that in the landfill? Unfortunately, this leaves out all the various plastic which are a volume of material. I do agree that packaging is a major issue. But I don’t see this changing without government intervention. We recycle pop and beer cans and bottles today because of government mandated deposit. Could designs for plastic containers for thousands of products be created in a manner which would work with a deposit as well? Perhaps, but not without laws requiring such. Or, one can do the other government intervention and fine for people who do not recycle properly, which is already starting in some communities. I strongly reject that approach though. Consumers have little influence on packaging. Choosing to find some other brand of dental floss that works well and uses less packaging is not on the cards, as the alternative is not there. Also, if it even costs 5 cents more, most folks will ignore it and choose to save the nickel. The difficulty in recycling is dealing with contamination. My pre-retirement employer dealt with a relative clean stream — boxes from commercial operations. The biggest contaminant eas adhesive used to build the box. Takes specialized equipment to deal with that. We dealt with the occasional truck tire, animal carcass, well-rotted meat. Because biowaste was an occasional inclusion, the workers were HBV innoculated. China has pushed back because what’s been sent fails the 2% contamination miserably. What incentive do they to dispose of someone else’s $h1t? My take is that the post-collection de-commingling doesn’t work dependably. The trash stream isn’t likely to change, but the market requirements are clear. BTW, the rise of blister-packed items coincided with the rise supermarkets in the 50s. The small stores kept many things behind the counter or in a display. Convenience stores needed something else. why not have neighborhood recycling spots, with paper, newspaper, cardboard, magazine, glass (colored + clear). etc… some like electronics & oil may need to stay at a central point….. but the separation could be accomplished without everybody having 7 separate bins to pick up and at a lower cost than even now. You can take you excess recycling down to the recycle center, including oil. Electronics can also be taken to Republic. They have a spot for you to drop off your TV’s and Computers. Curb side you can put your oil out in a sealed container on glass day. Not in your commingle. set it on the curb by your glass. Yes there needs to be more education, but ultimately it is up to the consumer to make sure that they are recycling correctly. Republics web site is informative and out lines what can and can not be recycled. You can always give them a call if you are ever in question. It’s not just what type of plastics .it goes way Beyond what you all are talking about .I think some of the comments are right . Republic does need to educate the customer way better . But I have seen things in the recycling that everyone knows not too put in their .cat box litter , gdog poop , human wast . You name it I have seen it . Common sense goes a long ways. Styrofoam they never have recycled that at the curb . But everyone still puts it in their . Lots of people know better but don’t care not everyone but enough to where it’s making a big impact on the industry .clean up your act and get educated if you don’t know call and ask. Education seems warranted. Republic’s expertise is collection/transport/delivery. Social engineering to modify the public’s behavior is not in their wheelhouse. They already have plenty of material that clearly IDs what is acceptable. Let’s face it. We’re talking about trash, not barbecue. One thing that causes problems with recycling is that people don’t remove lids and throwing them in trash before recycling the bottles. Where I work in a grocery store, we use 8 recycling bins and recycle all plastic bags, plastic wrap and cardboard. We have separate bin for glass. What would be nice is Hasso would research how to recycle so we get it right. Things change.